Settled in 1833 and incorporated in 1967, Warrenville has a history rich in the American tradition. Blazing the trails west from New York, Julius Warren came to this area with his family claiming land along the DuPage River. Carving out a niche in housing development, Julius help new settlers by providing cut lumber for their homes as well as acting in other capacities including, surveyor, developer, land baron, mail carrier, census taker, spokesman, and innkeeper. Eventually earning the title of Colonel for his leadership in the community, Julius built an inn and tavern that became a popular gathering place for travelers and settlers alike. The town, taking on his namesake, continued to prosper with railroads and stagecoach lines crossing the community. The community remained a small, rural town for some time, surviving the toll of the Civil War. In 1967 with a population of 4,000 and five failed incorporation attempts, Warrenville finally incorporated with the Mayor/Council form of government. 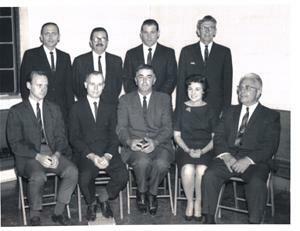 The photo to the right shows the original City Council including from left to right beginning with the back row, Alderman Richard Chroust, Alderman Carl Baldwin, Alderman Hally Haight, Alderman Harold Bollweg, City Treasurer James Yoken, Alderman Harold Karnuth, Mayor William T. Stafford, City Clerk Lucy Bernard, and Alderman Elmer Paver. Today, Warrenville boasts a population of 13,140, 63 miles of municipal streets, and a large business/commercial development along Interstate 88 known as Cantera. For more information on the history of Warrenville, visit the Warrenville Historical Society’s website or call (630) 393-4215.